What comes on your mind when you hear “Hot Potato”. I bet you think about a delicious meal with hot potato, cheese and bacon. Or the known Brasilian game. Well, this expression has nothing to do with the mentioned things above. To find out what it means. Listen to the conversation below. Hello and welcome to The English We Speak. I’m Neil. Oh what’s the matter, Helen? You look really tired. You’ve got very dark shadows under your eyes. Oh dear. Well, I’ve been pushed into a role and I don’t really want it. To be the treasurer for the school’s parents association and you know I am hopeless with numbers. Sounds like it could turn into a hot potato for you. Hot potato? Do you mean a jacket potato? No I am not hungry, I am nervous. I’m not talking about food. I am talking about this job. I can see it’s going to be a problem for you. You need to think about it very carefully before it becomes a hot potato. 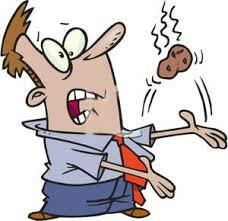 When something becomes a ‘hot potato’, it becomes a problem and difficult to handle. I see. You can’t hold a hot potato in your hand. It would burn you. The shortage of housing supply is fast becoming a hot potato for the council. The pay rise issue is a hot potato for management; I don’t know how they are going to sort this one out between the staff, the union and the shareholders. Just tell the school you can’t do it. Drop it before it becomes a real hot potato for you. Could you clear understand what “Hot Potato” meant in this context? So, leave us a comment with your example! I hope you have enjoyed this new post.